If it has wheels? We can appraise it! If it has wheels, we can appraise it! We do appraisals on Street Rods, Customs, Classics, Muscle Cars, Street Cars, Trucks, Motorcycles, Specialty Vehicles, Motor homes, Campers and Boats. Appraisals for: Pre-purchase inspections & agreed value insurance. Pre-accident value for insurance disputes and arbitration. Estate vehicle valuation, car loans, finance valuation and donations. Contact me for your car, auto, vehicle appraisal in Oregon. I am your car appraiser that travels to Woodburn, Salem, Albany, Dallas McMinnville, Newberg, Corvallis, Eugene, Lincoln City, Newport, Tillamook OR and all areas between. In the state of Oregon an vehicle appraisers license is required and authorizes an individual to appraise vehicles as provided in ORS 822.110,ORS 819.120, ORS 819.130 and ORS 87.192. BE CERTAIN YOUR APPRAISER IS LICENSED or you may be wasting money on an appraisal that will not be honored. 2. Certified / Accredited by the International Vehicle Appraisers Network. 3. Graduate of the I-VAN Appraisers Training School. 7. My appraisals are accepted by banks, credit unions, insurance companies, museums, IRS and courts of law. 8. My appraisals and the proper IRS forms are accepted by the IRS for donations to museums and other acceptable charitable organizations, providing tax deductible contributions. 10. Former Factory Sales Representative in the automotive aftermarket calling on national and regional Auto Parts Stores. Duties include sales and product knowledge training to customers and sales force. 12. 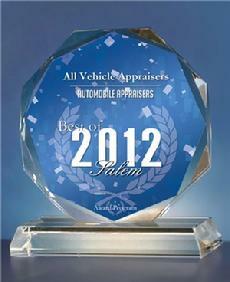 All Vehicle Appraisers has been selected for the 2012 Best of Salem Awards in the Automobile Appraisers category by the Salem Award Program committee.